My iPhone 6 and iTunes has been on my windows 8 computer, and I have been getting frustrated with the fact that my iPhone will not sync with iTunes. It’s like my iDevice is not being recognized by iTunes. Therefore, I could not transfer songs from iPhone to my PC. My sister also experienced the same issue when trying to synchronize her iPod to iTunes, please help. Peradventure you find yourself in that frustrating situation, here is the solution to the problem and get your iPhone syncing with iTunes on your computer or Mac again. At times, just updating your iTunes to the latest version is all you need to resolve the problem that iPhone will not sync with iTunes, especially when the desktop software has not been updated for some time. By default, there is always a notification for an upgrade immediately there is a new version of iTunes. Also, your USB port becomes bad, although this is pretty rare and it can be ruled out easily. All you have to do is to switch the USB cable from one port to another and check if it will work. You can also try using an entirely different USB cable be it a lightning cable or an old 30-pin adapter. If you iPhone will not sync with iTunes, your sync button is completely grayed out and unavailable, or if you have tried to sync and nothing is transferred over to the iDevice, you may simply have to authorize the PC with iTunes. 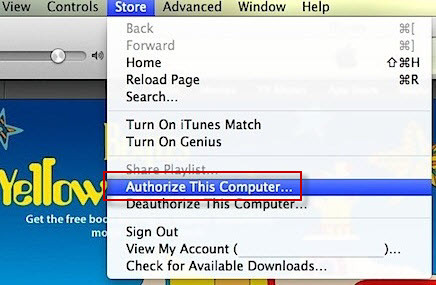 There is an authorization that iTunes uses which ensure that only a handful of computers can access your purchased videos, songs and other content at any point in time. By the time you authorized your PC or Mac, and then you are permitting it to access your apps, books, movies, music, audiobooks and other files. Restarting your iDevice and PC could be very effective in solving iPhone will not sync with iTunes. All you have to do is hold down the Power button and Home button simultaneously until both devices reboot. Technically, this method is called a Hard Reboot since you are forcing the iOS device to restart. Also, in some cases when things are crashing, acting up, or just not behaving correctly, it is often more effective to force reboot than just using the standard power-off approach. An alternative approach when your iPhone will not sync with iTunes through USB cable is Wireless syncing. Step 1: Go to iDevice summary dialog in iTunes on your PC and click on sync with this iPhone over Wi-Fi. 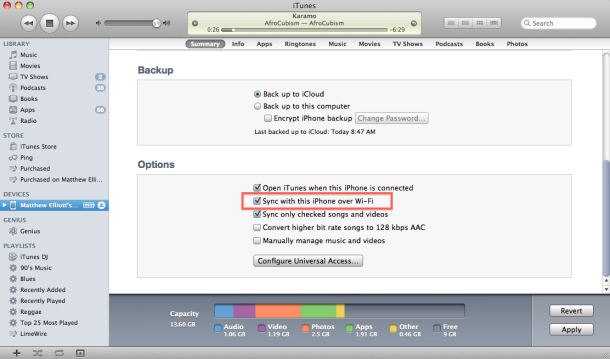 Step 2: After that, on your iPod, go to Settings> General>iTunes Wi-Fi sync, then press Sync now. Note: When using this method, ensure that both the iDevice and PC are using the same wireless network, else it will not work. Peradventure, your iTunes still can't detect your iPhone, and then you can use Tunesmate to sync your iPhone to iTunes. As there are too many limits of iTunes and sometimes iPhone will not sync with iTunes. 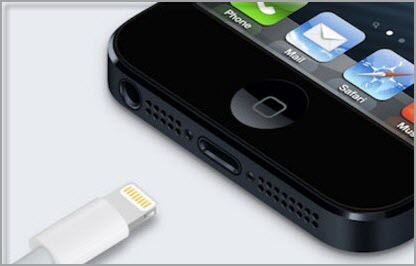 Many people want to sync their iPhone without iTunes. With iMyFone TunesMate, you can solve this problem. All you have to do is install and launch the app on your PC and sync your songs with it. This application is handy because it supports every file type and it allows you to manage and transfer your music and videos formats the way you want. Two-way transfer: It allows you to transfer all your files to iTunes library for rebuilding without having to open iTunes. 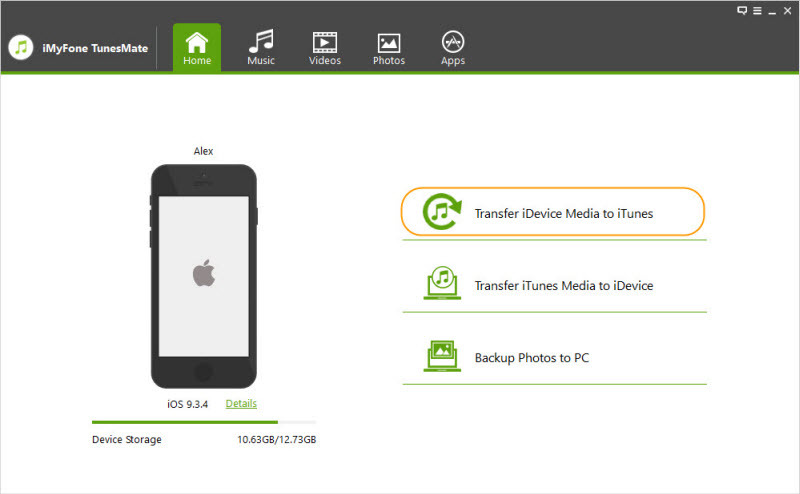 Export iPhone/iPad/iPod: It can export files from/to different PC/iTunes and devices. Transfer Non-purchased files: Even non-purchased files can also be exported. Enrich iTunes library: You can enrich your iTunes library from different unlimited iDevice. All Media Files Supported: Transfer files including music, movies, playlists, podcasts, audiobooks, TV shows, iTunes U, photos, and 10+ more. 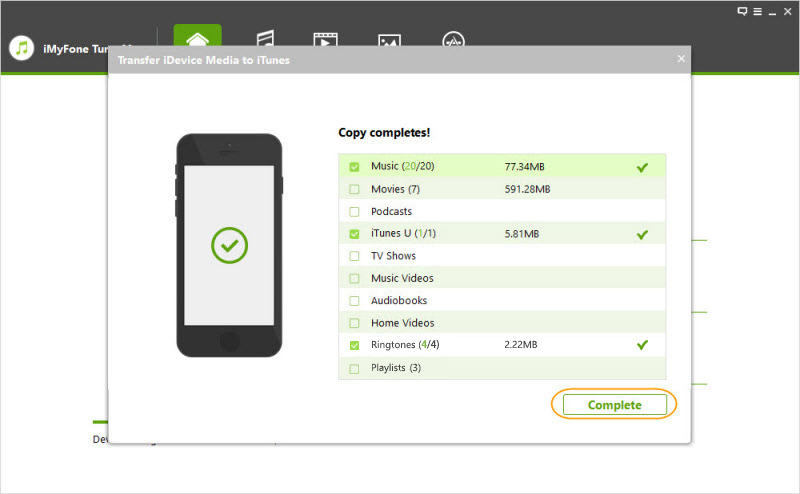 Step 1: On your PC, download and launch iMyFone Tunesmate and use a USB cable to connect your iDevice. 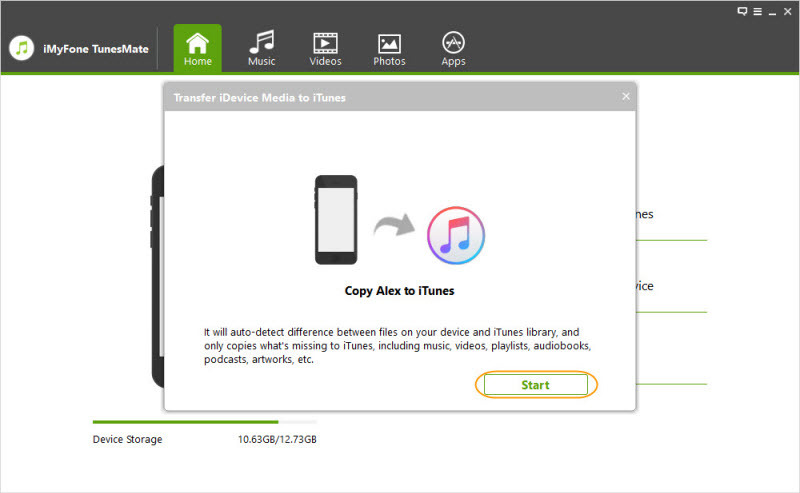 Step 2: From the Home interface, “Transfer iDevice Media to iTunes” and press “Start” button from the pop-up window for the process to continue. This will scan all documents present on your device which are not in iTunes library and display them by list. Step 3: By default, all the file types will be scanned. If you want, you can uncheck the file types you don’t want to transfer. After that, press “Start” button to begin the transfer. Tap on “Complete” button located in the pop-up window of “Completes” to finish it.